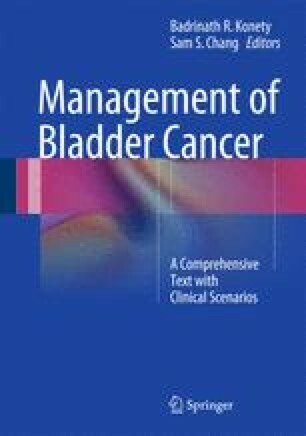 Value of chemoradiotherapy in bladder cancer: Standard treatment for muscle-invasive bladder cancer is cystectomy. Trimodality treatment, including transurethral resection of the bladder tumor (TUR), radiation therapy and chemotherapy, has been shown to produce survival rates comparable to those of primary cystectomy. With these programs, salvage cystectomy has been reserved for patients with incomplete response or local relapse. During the past decades, organ preservation by trimodality treatment has been investigated in prospective series from single centers and cooperative groups, with more than 1,000 patients included. Five-year overall survival rates in the range of 50 to 70 % and higher have been reported, and approximately three-quarters of the surviving patients maintained their own functioning bladder. Clinical criteria helpful in determining ideal patients for bladder preservation include early tumor stage (including high-risk T1 disease), a visibly complete TUR, and absence of ureteral obstruction. Close coordination among all disciplines is required to achieve optimal results. Future investigations will focus on optimizing radiation techniques and incorporating more effective systemic chemotherapy and targeted agents, and the proper selection of patients based on molecular makers.